Berlin airlift proposed for Pakistan. 50,000 dead, 3.5 million at risk. The US has a chance to do some good and advance its own interests at the same time. Thrasymachus, Socrates, Aristotle, Alcibiades are...Republic Dogs. A public figure who is competent, disinterested, intelligent, and well-spoken sure stands out these days. Can extreme right-wing creationists save rationality from the depradations of the left? Self-help for infectuous disease comix! -- "The Intimate Contest for Self-Command"
Yeah. Well, this feeds into one of my old interests, the multiple-centers-of-control problem for minds, as described by Minsky for humans and Tinbergen for animals. It's interesting to get the economist's view. If you stare at this stuff long enough you have to take up Buddhism though, and I'm not sure I'm ready for that. Schelling gets extra points for going against the prime directive of economics, which is a picture of a person as a rational agent with a unified self, well-ordered goals and desires, and a perfectly rational approach to achieving them. And for coining a good word to describe what he's talking about, egonomics. I can't decide whether to be serious or not in this blog, so I'll be both. First, blowing up the point of the following post, is this site that will build you your own Web 2.0 company. Now that's out of the way, I can be semi-serious. Web 2.0 is going through a typical technology hype cycle, cresting with the recent trendola conference and now with some backlash starting to set in. As usual, I'm way out of sync -- I just got started using del.icio.us a few weeks ago and it was only a few days ago that I really had the epiphany, felt the power of it, got absorbed in the growing collectivity. Blogging is part of it too...so, I'm trying to get with the program despite being an old isolationist fart whose idea of computational nirvana is to immerse myself in a Lisp environment, just me and the symbolic structures, no other people necessary. Well, I'm trying to get past that. I'm actually working on a project that (crazily) has multiple people living in the same Lisp environment. Summary: Web 2.0 is obviously a hype bubble, but like Web 1.0 the hype bubble is just an overamplification of some real advances. Interaction on the network is starting to get more conversational, collective, and participatory, while interesting new forms of media are being invented on a very rapid basis. Somewhere I called this a "cambrian explosion of web software". This essay on The Amorality of Web 2.0 came out awhile back and is being widely read and commented. I like how it punctures some of the more rapturous rhetoric that pours out some of our more, ah, effusive technopundits. Most of the substance of this post (and later followups) are based on a critique of Wikipedia's quality. I have to partly agree with this, and to tell the truth I've never quite seen the point of the Wikipedia. But the same critique does not apply to other Web 2.0 media, like tagging (which has a more workable model for joint authorship) and blogs (which are a bazarre of conversations rather than a jointly-built textual cathedral). The end of the essay is worth paying attention to as well, as he gets back to the title and points out that there's no guarantee that a world taken over by Web 2.0 is better. In particular, if low-quality, free, amateur productions (Wikipedia) kill high-quality but expensive productions (Encyclopedia Britannica), has the world gotten better? I used to have this worry about open source and sometimes still do. Joel Spolsky, on the other hand, is just being irritable and reactionary. Many other developers have echoed him. Can't say I blame them -- the antithesis of hype is anti-hype. What we need is a theory of hype -- some way to analyze technology trends that can filter out the hype and distinguish the reality underneath. Remember "Push"? "Kiss your browser goodbye: The radical future of media beyond the Web." Uh huh. Well, push was hyped to the max (defined as being the subject of a Wired magazine story), generated some companies which either faded or found something else to do, and now, eight years later, is back in the form of RSS feeds, is real and useful, and is being swept up in a larger hype bubble. It would be nice to understand the dynamics of such things, but I guess that's what VCs do. Leon Wieseltier has a piece (sub required) in a recent New Republic whose main point is to sniff at Brad Pitt and Angelina Jolie's attempts to take up causes and be public intellectuals. Hard to argue with that, although a public intellectual who does guest spots on The Sopranos is hardly the right person to rail at the intermingling of politics and entertainment. But I have a suspicion that they corrupt the consciousnesses that they raise, because they confirm them in their belief in the moral authority of fame. With the exception of the cognitive habits of a Googling nation, nothing more disfigures personal authenticity in America than the veneration of celebrities. This is America's polytheism. So "the cognitive habits of a Googling nation" are the thing that most "disfigures personal authenticity"? What does that even mean? I started off writing this post because, as the coiner of the term "googlectual", I wanted to defend a style of thought and writing that relies heavily on just-in-time searching and reading of texts on the Internet...or something like that. But I realize that I have no idea what Wieseltier is talking about, so I can't really form a reply to it. Maybe my cognitive habits have become permanently disfigured. There's a serious issue in here somewhere -- what does the Internet, Google, etc. do to serious thought? Are academic blogs a great way for ideas to circulate both within and without the intellectual communities they serve, or just a distraction from serious work? Are we all becoming ADD-addled from information overload? Well, no time to answer that now, gotta go catch up with my inbox. Cosma Shalizi has a nice takedown of Stephen Wolfram's A New Kind of Science, somewhat late for a book that came out in 2002. Back then, I leafed through it casually and my impression was that it was a mixture of self-aggrandizement and old ideas. Now Cosma knows much more about this stuff then I and has actually read the book, and come to much the same conclusion, so two points for my intuition. Since everything I think these days gets mapped to network theory, the major lesson I draw from this (not very original) is that science is a network of people and ideas, and if you operate outside of that network you are very likely a crank. Wolfram's egomania led him to pull out of the standard networks of scientific exchange and build his own little cult empire. By draining energy from real science, his book is an anti-contribution. Hm, Cosma also proposes applying social network analysis to the study of government cronyism, something I was vaguely thinking about myself. As he says, a difficult project to fund. New fall series, sounds like must-see TV to me. I went to see the new John Adams/Peter Sellars opera Doctor Atomic about Robert Oppenheimer, Los Alamos, and the Trinity test. Review to follow. At the same time (more or less) I was reading this depressing article about A. Q. Khan, the father of Pakistan's nuclear weapons and purveyor to the trade. Put these two figures side-by-side and what does it reveal? Well, Oppenheimer is by far the more attractive figure, an incredibly intelligent, dynamic, and cultured guy, as opposed to the egotistical and sleazy Khan (or maybe he just had better press agents). Both served their country as they felt called to do, both ended up more-or-less disgraced. Oppenheimer's bomb was used on population centers; Khan's hasn't yet, but it may be only a matter of time. Aside from the character of the chief scientists, what's interesting to me is the networks of people, technology, money, and resources that went into the respective bomb projects. 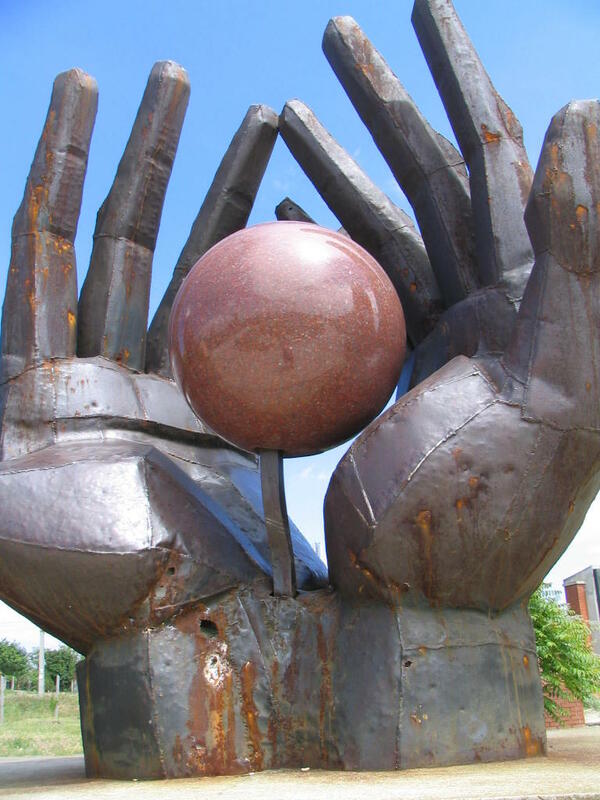 The Manhattan Project was an incredible mobilization of resources, involving some $25 billion dollars (in today's money) and tens of thousands of people including many of the best scientists of the time. The Pakistani bomb was assembled by a fourth-rate power through an international network of shady deals and borrowed expertise. although it certainly wasn't trivial to do (a good thing). I've noticed for a while that it takes big concentrations of power to achieve serious technological breakthroughs (in practice, this means governments or monoplistic corporations like the pre-breakup AT&T). The Internet, that paradigm of decentralized power, was only built the way it was due to the resources and oversight of the military. Once the big breakthrough is achieved though, smaller actors and networks can take over the results and repurpose it. That's happened with the Internet, and it happened with nuclear weapons technology. Until just now, I always thought that this was an argument for concentration of power, which I grudgingly accepted despite my leftist leanings. But maybe it's an argument against. A decentralized society might not have made the internet but they wouldn't have made thermonuclear weapons either. The internal capitalization doesn't really help. I should have known the big boys would already be staking out the netarchy territory. Harvard has something called The Program on Networked Governance which looks really interesting. It's not a particularly radical vision of what networked government means (hey, it's the Kennedy School of Government), more oriented towards figuring out the networks that connect current pieces of our existing governmental institutions (between agencies, for instance, and also connecting voters and their representatives). Neat stuff. Via Bruce Hoppe , who muses on whether they will uncover the deal-making networks of which Tom Delay is the hub. This seems to point to a general problem in both social network analysis and software: the real interesting networks probably don't want to be uncovered and made public in a neat little graph. Of course, the criminal investigation branch of this field has already thought about that. Taking a break from the profound issues of God, death, time, and sociology that we usually deal with here, let me relate a tale: my phone bill this month had a mysterious unexplained charge of $7.39 from "ILD Teleservices". Calling their number revealed, after a 10 minute phone tree and wait, that this charge was from a single 411 call, which apparently gets farmed out from the local carrier to an assortment of unscrupulous company. They agreed to drop the charge after I yelled a bit. Turns out these people have a history. And the scam is common enough to have its own name, "cramming". Apparently the complex multi-company billing infrastructure of the phone industry is being hijacked to allow all manner of bottom-feeders add any charge they feel like to your bill. Welcome to the world of the future. I imagine there is some sort of differntial pricing going on here, and they try to keep the charges low enough so you won't take the time to complain and try to get the charge dropped, or go to the FCC. Any ecology (or economy) has its parasites. Networks make new forms of parasitism possible but thankfully they also strengthen the immune system, like that consumer watchdog site linked to above. Social networking applications for the real world. I had been seeing this guy's name around in various things I'd been reading over the years, in a variety of interesting work on the origins of segregation, conflict and coordination, and more recently invoked as an explanation of why people love government. I even had some vague ideas on the back burner about using the same ideas in that last paper to explain gods and religion, which I was thinking of turning into a blog post. Well, before I get around to helping increase the guy's fame, he goes ahead and wins the Nobel Prize in Economics. I sort of feel like I wish I had bought stock in him. Anyway, he's a very readable and interesting writer and apparently a very nice guy, so congratulations to Thomas Schelling. Update: Good summary of Schelling's major contributions from one of his mentees at Marginal Revolution. Watching "This Week in God" on Jon Stewart's Daily Show, we are, it might seem, witnessing the culmination of a historical progression, from Robert Ingersoll, the great nineteenth-century public unbeliever, to Clarence Darrow, who in the 1920s and '30s would debate a rabbi, priest, and minister during a single evening. I am occasionally against the sort of "villiage atheism" promulgated by people I mostly admire and agree with, such as Richard Dawkins and PZ Myers. It seems too simpleminded for me, and also strategically unwise, since religion won't be argued away by any amount of scientific evidence. This article puts the struggles between these scientists and creationists in historical context. Atheism tries to take the place of faith but it just doesn't work, for most people. And it has some unpleasant characteristics of its own, which I think stem from its unavoidable tendency to assume the shape of a religion, despite its best efforts. Think of atheism as a sort of drug that is trying to block the religion neuroreceptor in the brain. It has to take the shape of a religion without having the effects. This is only partially successful, and atheism despite its efforts tends to assume some of the negative attributes of a religion, namely fundamentalism and zealotry. Classical atheists tended to be optimistic about the world's future, and their imaginations were indeed stirred by science and technology and the potential for human progress. Rejecting religion often coincided with placing hope in reason, education, democracy, and/or socialism, and those who did so were stirred by visions of a more humane, happier world organized according to human needs. Looking expectantly to the secular and social future meant rejecting the religious counsel of pessimism about our lot on earth. It's safe to say that the future didn't turn out as anyone expected. Scientific and technological progress has been relentless, but its promises of liberation have gone flat. Few still believe that their children's world will be better than theirs. We live after Marxism, after progress, after the Holocaust—and few imaginations are stirred, few hopes raised by our world's long-range tendencies. Indeed, the opposite is happening as terrorism becomes the West's main preoccupation. In countries like the United States, Britain, and France, there has been a turning away from improving societies and toward improving the self. On this terrain, it is no surprise that belief in God has been revived, ... At stake, then, is far more than a conflict between belief and disbelief, but the kind of world in which a religious or a secular worldview flourishes. Where secular hope is in the ascendancy, as during most of the nineteenth and twentieth centuries, it seems as if the belief in human capacity and the here and now will be strong; where fear and pessimism increase, as they have so far in the twenty-first century, humans may increasingly look to God, to their souls, and to a future beyond this life. What is most striking after reading Baggini is Harris's own zealotry. Harris makes no effort to understand believers, be they moderate or fundamentalist; most serious in a book claiming a practical political mission of uniting "us" against "them" is his total lack of interest in any historical understanding. Harris, for all his negative energy, provides a potentially rich idea about mysticism, as cultivated in Eastern religions, as a "rational enterprise." In Buddhism, he argues, reaching beyond the self has been carefully and closely described and need not be left to faith but may be empirically studied. I tend to agree. Buddhism is definitely the religious belief system most compatible with a scientific materialist worldview. But I'm dubious that it will have much market impact on theistic religions, which seem to give the people what they want. Personally I'm leaning towards Yoism, the first open-source religion, which I learned about 10 minutes ago. Or maybe the Flying Spaghetti Monster. 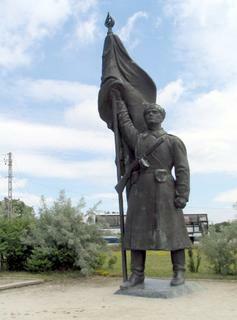 I took a trip to Budapest a few months back. A beautiful and vibrant city, full of intricate architecture and good food, still in the process of shaking off its long history of being caught in between empires and winding up on the losing side of wars. 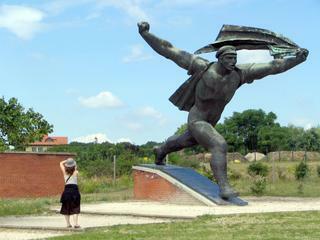 There are many serious memorials to the failed uprising of 1951. That's one way to get past dictatorship. Another is to take all the kitschy public sculpture erected by the communist regime, and put it in a park out in the suburbs and turn it into a tourist attraction. 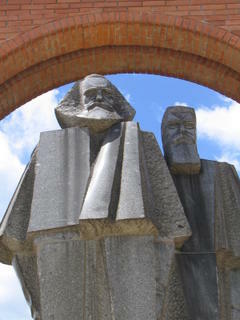 Marx and Engels look blockily down on the world they helped make. He's got the whole world in his rusting, metallic, inhuman hands. The locals call this one "Cabana boy rushing to rescue a bather who lost his suit", but it's real name is "The Republic of Councils Monument", and it's huge! The real face of the occupation. After the quick visit to Sculpture Park, I managed to squeeze in another side-trip to Gödöllö, a three-umlaut town with a restored Baroque castle, a summer retreat for the Emperor Franz Joseph and the royal family. The hugeness and luxury of such places is supposed to fill one with awe at the power and sumptiousness of the art, but for me they mostly inspire rage at the wastefulness and inequality that had to go into the creation of such a lifestyle for the few. In other words, it gave me a bit of sympathy for the commies, despite their bad taste and their own forms of oppression and murder. It put it in context, at least. In between these two trips I had to hurry to catch the train out, so succumbed to McDonald's, which I guess represents the end of history, no more class warefare, nobody suffers but the cows, the environment, and health. Update: more here. The pictures of East European stamps whisked me back to my childhood philatelist days, when I was puzzling over all those blocky hammer designs and why they seemed to be associated with "democratic republics". Hah, I just found that the earlier incarnation of this blog still exists in the memory of the internet archive: Same topics as the current one, pretty much: doom, religion, software, politics, economic thinking, making up words, family life, anarchism, mathematics -- roughly in that order. Actually, it looks like many of the older posts are missing or have been trampled upon when I let the website registration lapse. Foo. Well, I have them all on disk actually, including my proposal for "The Association of Anarchist Parents", which I will have to repost. James Clark McReynolds is widely considered one of the most unpleasant men to ever sit on the Court, being labeled "Scrooge" by Drew Pearson. He would not accept "Jews, drinkers, blacks, women, smokers, married or engaged individuals as law clerks." He was a blatant anti-semite and refused to sit near Louis Brandeis (the first Jew to sit on the Court) where he belonged on the basis of seniority for the Court's annual picture to be taken in 1924; ... During Benjamin Cardozo's swearing in ceremony he pointedly read a newspaper muttering "another one", and did not attend Felix Frankfurter's, exclaiming "My God, another Jew on the Court!" ... He was also a confirmed misogynist. Taft said McReynolds "seems to delight in making others uncomfortable." This is in support of the position that Harrient Miers is not really all that bad, considering. The MSM is full of stories about people returning to New Orleans to try to pick up the pieces of their lives, but it's pretty rare that they pull back and ask the question if it makes sense to try and rebuild at all. For that, you have to read political humor blogs like The Poor Man, where there is a good case against, except they omit the complicating factor that the Mississippi really wants to be somewhere else, which might make rebuilding easier in some sense, except there won't be any real reason to have a city there other than tourism. Several major blogs are collectively trying to puzzle out why people don't believe in evolution. I'll survey what they have to say and give my own take on this below, which is based on cognitive psychology. Short summary: people have different kinds of worldviews which apply in different types of situations. Applying the mechanical, causal worldview of science to ordinary life leads to confusion and can appear threatening. Reconciling different worldviews is difficult, even for the intellectually sophisticated, so it's no wonder that ordinary citizens have problems with it. 3quarksdaily: People reject chance and uncertainty. I don't buy this one, and neither does PZ Meyers. People love chance and pay money to experience it, and they recognize uncertainty. If you read further in this post it touches on "purposelessness", which I think is closer to the mark. Evolution will continue to be controversial as long as people believe that naturalism threatens meaning. I don't know how proponents of evolution can begin to make people feel more comfortable with the naturalistic worldview. This is getting closer...people really do feel threatened by the naturalistic view, but there are good reasons for this. See below. Faith in a holy cause is to a considerable extent a substitute for the lost faith in ourselves. Which leads to the group psychology of religious crusades, yet another factor. My own take on this is from a cognitive point of view. First, it's a mistake to try to explain religion in terms of stupidity, fear, or group identity. No doubt these play a role, but aside from being snobby and dismissive, they don't explain religion specifically. People do lots of things out of stupidity and fear. People do lots of things out of group identity, like cheer for the Red Sox, but that doesn't make the Red Sox a religion. So, let's start with purposelessness, and let's take the standpoint that people are right, in some sense, to be wary and reject the purposlessness of a naturalistic worldview. Look at it in terms of practical reason. To make a long story short, let's assume a drastically simplified model of people's mental models, but not completely simplified. People have two different frameworks or stances (in Daniel Dennett's terms) for explaining phenomenon, the mechanical or naturalistic stance, and the intentional or animate stance. You can look at, say, a person as an intentional agent, with desires, feelings, ideas, etc, or you can look on him as a sort of chemical machine, with various mechanisms that work according to the causal laws of physics. In fact, of course, he's both, but the two frames of reference are rather disjoint and stiching them back together is the difficult work of cybernetics, psychology and other somewhat mushy fields of science. In everyday thought, people can apply these frames of reference as needed and switch between them. If their car breaks, they might curse it out (as if it was an agent) and then proceed to open the hood and repair it (as if it were a machine). Doctors have an elaborate methodology of ministering to a patient's humanity while treating their body as if it was a defective machine. So what does this have to do with religion and evolution? Science has a professional bias towards mechanical explanations, either eliminating agency altogether or finding ways to reduce it to naturalistic explanations. That's fine, that's what science does. But ordinary people with lives find this disturbing, for good reasons. They know that it's improper or immoral to apply the mechanical stance to people except in special circumstances (this I think is at the root of the Frankenstein mythos: those angry peasants have a point). Real scientists are not (usually) monsters, they have ways to reconcile their humanity with their dedication to the amoral and merciless mechanical viewpoint, but the peasants don't know that. Religion, on the other hand, has a bias towards intentional explanations, seeing agency everywhere, in people (souls), in nature (animism) and the universe as a whole (God). Science's challenges to the intentionality of the universe are one thing, but evolution and brain sciences threaten the very soul. This scares people, and goes against their moral and practical intuitions. What I'm trying to get at is that ordinary people, who may be ignorant of science and not inclined to philisipophy, still have a ideas about the consequences of different styles of thought. They know that the mechanistic worldview is in some sense incompatible with their intuitions. What they don't have is the sophistication to try to reconcile these worldviews. Scientists and intellectuals keep working at this problem, but nobody can pretend it's solved. In short, fear is at the root of people's rejection of evolution, but it's not a groundless fear. People understand, albeit vaguely, the different systems of thought involved and the conflicts between them. They feel that much is at stake, and they are right about that. It's not that surprising if the issues are played out at Kansas school board meetings, in unenlightening ways. This is hard stuff. There's a whole spate of books that purport to have some psychological or evolutionary explanation of religion. I own a bunch and have even read a couple. The one that clicked most for me, in that it concentrated on ascription of animacy, was Religion Explained by Pascal Boyer. I addressed some of these issues in my dissertation, which was ostensibly about programming environments but wandered off quite a bit. People at work worship at the metaphorical feet of a book called Code Complete, which is apparently a "runaway bestseller", a "software engineering classic", according to its back cover, where it is also endorsed by a variety of software gurus like John Vlissides, Alan Cooper, and Ralph Johnson. It's very big and covers everything from planning methodologies to how to structure your if statements. Recursion isn't useful often...For most problems, it produces massively complicated solutions -- in those cases, simple iteration is usually more understandable. Use recursion selectively. For some reason, the term "netarchy" is not being used to describe the social/governmental structures that are going to subverty nasty old hierarchical structures we are saddled with. It is not a totally unknown term but does not appear in google blog search (until now). I'm not even sure what exactly netarchy means, although it sounds attractive. It seems as if it would be a good title for a book by some high-powered internet pundit, which I am not, although I suppose I must have some aspirations in that direction or I wouldn't be blogging stuff like this. So what the hell is netarchy? Rule by social networks, I guess. It could encompass a wide swath of social network theory, but it's emphasizing that these networks aren't just for chatting, but for coordinating goals, actions, and power. This is the interesting part of SNA (to me) but often seems lost with the emphasis on dating services like friendster or job-finding services like linkedin or marketing tools like visible path. The important social networks are outside of such simple-minded mapping schemes, I'm pretty sure. Something like theyrule.net is a little closer to the mark, but too conspiracy-minded, as is the ridiculous Discover the Network site, beautifully parodied here. Netarchy acknowledges such traditional power-networks, but instead of reacting in horror accepts them as a given and tries to work with them. One way to do this is simply by mapping and talking about the power networks, as the above sites do. Another is by encouraging the formation of counter-networks. There's a paper by Valdis Krebs called "It's the Conversations, Stupid!" where he points out that ordinary social networks are a strong determinant of voting behavior. A somewhat obvious point, except that most analyses of voting behavior are in terms of individuals, demographic groups, or interest groups. These are not the same as networks, and the network approach provides some interesting strategic insight. Networks already are a big, unacknowledged part of democracy, even if they are not yet acknowledged by changing the name to netarchy. Netarchy encompasses not only the crony networks that are the obsession of conspiracy theorists, but the more bottom-up networks of a functioning democracy. Netarchy can be used to describe existing political phenomena but may also be used as a guide, or at least a slogan, for generating some new ideas about how to run a society. Maybe it's time to revisit the lovely but rather old-fashioned models of democracy we have inherited. Direct democracy doesn't scale and lacks the damping factors of a separate political class; representative democracy has some of the opposite problems -- elites lead to self-serving corruption. The old science-fiction model of an electronic plebescite voting on issues directly might not be so great, if the model of California's ridiculous ballot propositions is anything to go by. But why not some sort of more flexible network based representation system? How about a website where I can pick new political representatives for myself at any time, rather than at artificial 2, 4, or 6 year intervals? How about if I can pick specific ones for particular issues? I don't have time to study every environmental question in detail, but I'd be happy to be able to designate the Sierra Club or the Viridian Underground as my representative on such questions, with an option to override on specific bills. When it's time to draw up the new constitutions for the Devolved Former States of America, let's try and be open to these and other netarchy-inspired ideas. Addendum: and so it begins? My review of The Long Emergency reads a little bit more negative than I intended. 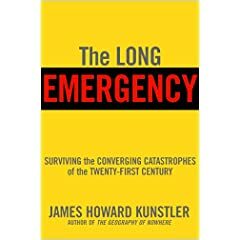 On the whole, I think Kunstler should be taken seriously -- all of the trends he points to are real, the ability of our economy and infrastructure to adapt rapidly is dubious, and there's a good chance that things can get as fucked up as he predicts. Pacific Gas and Electric Co. warned Friday that Northern California home heating bills would leap 70.8 percent in October as hurricanes Katrina and Rita drive up natural gas prices nationwide. and electricity prices along with it. The weather may provide Californians some consolation. Long-range forecasts from the National Weather Service call for higher than normal temperatures through December, said David Reynolds, meteorologist in charge of the service's Monterey office. See? What global warming taketh, global warming restoreth. Sort of-eth. A book in the we're-all-doomed genre. Kunstler focuses on the coming peak oil crisis and our incapacity to deal with it. A long-time critic of suburbia, he is onvinced that our investment in car-dependent infrastructure is really what's going to doom us -- we will be completely unable to adapt to a world of scarce and expensive energy. While this is the central crisis, other related ominous trends feed into the general sense of doom -- global warming, emerging diseases, and a economy based on no-longer-supportable fictions. Globalism and the Wal-Mart economy comes in for some whacks, based on their cheap-energy-dependent business model. None of this is exactly news, but Kunstler does the serivice of wrapping all these alarming trends into a readable package designed to wake people up. The future looks pretty bleak, with the degree of bleakness dependent on the degree of energy dependence vs. the degree of sustainable communities. The sunbelt states (Arizona, Southern California) will suffer the most as the cheap air conditioning goes bye-bye. Suburbanized areas will be doomed. The Northeast will recover its old structure of small industrial towns which can support local manufacturing and local farming. This vision suffers from being completely backward-looking, and appears to be fueled by nostalgia. Essentially, the idea is that the entire 20th century will be undone, and we will go back to the way we lived before abundent petroleum-based energy -- we'll be mostly farmers. This seems extremely unlikely to me, and undesireable as well. Modern technology will not disappear, although it may change radically as its components become more expensive. Telecommuting has the capability to replace physical commuting, for instance -- this is not an option Kunstler considers, since he apparently believes that all modern technology is going to disappear along with the oil. This is a form of flawed argument that pops up frequently in the book. There is an implict assumption that oil is going to completely run out (rather than just becoming expensive) and that anything that is even a little bit oil based now cannot work in the future. He dismisses solar energy, for instance, because it takes non-renewable resources to manufacture and transport the panels. Whether solar is workable under conditions of oil scarcity requires a quantitative economic argument -- it's not going to be an all-or-nothing thing. The book is also marred by a misunderstanding of scientific concepts like entropy and closed system. In general Kunstler does a reasonable job of presenting the technical side of his argument, but occasionally distorts things to support his argument. In short, this book performs the valuable service of waking people up, but is not a reliable guide to the future.